It seems like everyone is looking for money making ideas to earn a little extra cash. Who wouldn’t love to do something fun AND earn extra cash with hobbies that make money? Whether it’s selling money making crafts online, shooting photography locally, r taking advantage of social media there’s a way to turn your passion into extra cash while working at home! Today I’ve got an awesome list of booming hobbies that you can do to make money from home and resources to help you get started! How do you find hobbies that make money? Start by finding something that your passionate about. What are some things that you LOVE doing in your spare time…is it hiking, drawing, crafting, photography, health and fitness, baking…or maybe you’re interested in online hobbies like graphic design, social media, gaming. You can turn any of these hobbies into extra cash by teaching other people about the hobby you are passionate about. You could teach a class online, host a local class, lead a tour, or share your journey online through social media or blogging. 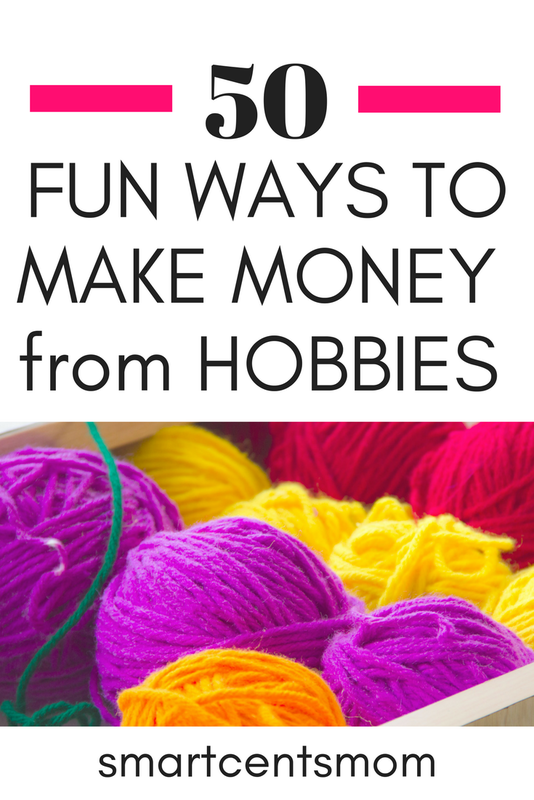 There are so many options for making money with hobbies! Let’s get into this list of profitable hobbies that you can use to earn extra cash for your back pocket! Surveys typically only take 15 – 20 minutes. I especially love the ones mentioned above because you can earn points for surveys that you don’t qualify for so you aren’t wasting your time answering the prequalifying questions. You can earn even more money with longer surveys that are apart of focus group studies. Find out how I earned $150 for 90 minutes of work! Use these tips to start making extra cash with surveys quickly. Crafting has recently hit it’s stride as a way to make money. You can create crafts to sell online, at local craft fairs, and through Facebook’s Marketplace. Wondering what type of crafts you should make to earn the most cash? I did a little research and found some top trends expected for 2018 in DIY/Crafting. Check out Pinterest’s top 100 trends in DIY/Crafting here. And you can also find crafting trends from Creativation, a craft/creative industry convention showcasing upcoming trends. I found this article from Craft Industry Alliance to be really inspiring and helpful for planning craft ideas. Find more crafts that make money! Does correcting grammar make your heart happy? Have you been marking this post with a red pen this whole time?! Then you might have a passion for proofreading. Did you know you can make serious cash proofreading online? You can proofread everything from blog posts, emails, newsletters, books, scripts, and more! My friend Caitlin Pyle of Proofread Anywhere has been earning a full time living proofreading for years! She now teaches other people how to get started as a proofreader and gives you all of her resources to help you get started! Check out her free workshop that gives you an idea if this is something that could work for you! Sign up for Caitlyn’s Free Proofreading Workshop! Read more about getting started with general proofreading and how you can make REAL money as a proofreader! Make money as a personal shopper with Instacart. It’s such an easy job if you love grocery store shopping! Here’s how it works…take orders from customers with the Instacart app, shop at the local store, and deliver groceries to the customer. You get paid based off of the size of the order, number of deliveries made, and tips. Instacart is a growing company with flexible hours. You can shop and make deliveries between the hours of 9am – midnight. Sign up with Instacart and Start Shopping Today! You can make money on social media! So for all of you who are obsessed with Pinterest, Instagram, Facebook, Youtube or any other social media site, get excited because you can turn those hours of pinning into extra cash! You can create an account and become an influencer on a social media channel of your choosing. What is an influencer, exactly? Someone who has a big following in specific niche and makes money through sponsored posts or ads. It can take a while to build your social media following to a point where you are earning a decent amount of income. This is a great way to start earning quickly through social media. Basically you will help businesses and bloggers set up their social media to drive traffic to their products or website. You can get paid to play on Pinterest or any other social media platform! You will need to know how to use Pinterest for business, and I highly recommend this course Become a Pinterest VA Today! They teach you all the tips and tricks to use Pinterest to drive traffic for businesses as well as how to find your first client! Flea markets, yard sales, estate sales, and thrift stores have all kinds of treasures that are hidden from the oblivious eye. You need to do some research and keep your eyes open for unusual, but very useful items that you can sell on sites like eBay and Craigslist. My friend Melissa and her husband over at Flea Market Flipper are making a solid income selling used and new items online. They were able to earn over $130,000 flipping items online in just one year! Read more about Melissa’s craziest flea market finds and how they made a profit! There are several ways you can make extra cash with a photography hobby! Sell your photographs online to websites like istockphoto.com or shutterstock.com to make money fast and easy! If you are an amateur photographer this is a great place to get started selling photos online. They make it easy and free to upload. You may make 15% – 50% of the image sale price depending on the size of your portfolio, number of purchases, and exclusively sharing images to one site. Start a stock photography business. Bloggers and online business owners are always looking for unique images that they can use for their online presence. If you can take photos that stand out in a flood of social media images then you will be able to grow an online stock photography website. Check out IvoryMix and Haute Stock. Another way you can make money with photography is by taking photographs of families, weddings, special events, etc. These can range in price from $150 for a 1 hour session to thousands of dollars for a wedding. “A day in the life” images are trending right now for families. It’s such a fun idea…capturing families at home doing normal activities. 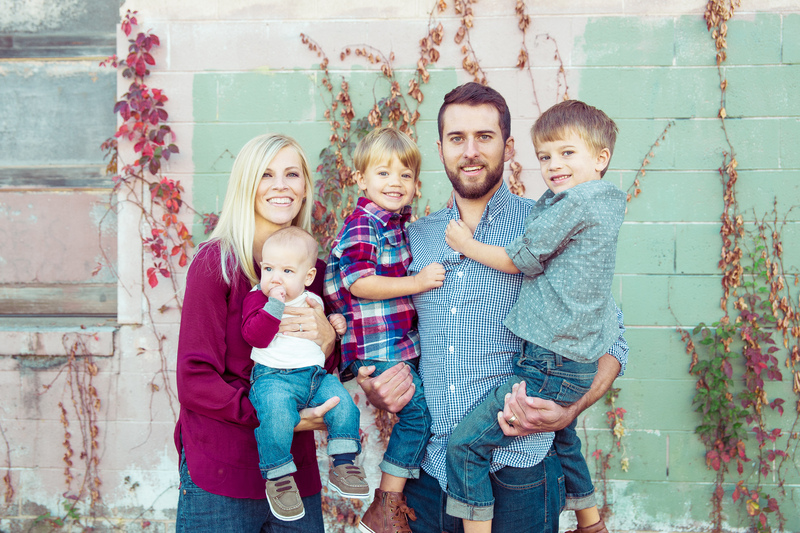 Our family photographer, Lauren Ladd, has done some really beautiful shoots with families. Here’s our family picture from last year. More ideas? Focus on a niche topic in photography like Sara McAffry Photography. She exclusively does graduation shoots, and they are incredible. Read more about her story making money as a photographer. Local gyms and community centers are always looking for people to teach a variety of different group exercise classes. You could also work as a personal trainer teaching people to lift weights and get the most from their workout. So if you love getting into the gym and encouraging people to get the most out of their workout, this might be the perfect side hustle for you. You can get your workout in and make some extra cash! Are you a gifted baker and decorator? This is a sweet side hustle for anyone who loves to bake. You can make cakes and cookies locally or even ship items through sites like Etsy. These kind of desserts are perfect for parties, weddings, and any celebration. I am seriously mezmerized when I watch cookie decorating, and I’ve given it a try…but it was a major Pinterest fail. I’ll be buying my themed cookies from somebody…why not you! Ok, this is probably my favorite money making hobby because I am now making $1000+ per month from my blog! It’s so crazy…and I seriously love researching and writing fun blog posts like this for you! I love that you really can make money blogging as a side hustle. I only dedicate about 10 hours a week (that’s on a good week!) sometimes I only have 2 hours all week to get work done. BUT I’m still making money. Now, it took me about 9 months to start earning consistent money as a blogger, and most of that money comes from ads. I’m still learning how to effectively use affiliate marketing. Affiliate marketing is a way to make money by earning commission at no expense to the customer. Bloggers share affiliate links to products and services that they recommend to their readers. Almost everything you use has some type of affiliate link that you can use to earn money. Sponsored posts are another way that bloggers make money. Companies will pay bloggers to write about their product or service to share with their audience. These opportunities can run anywhere from free products to $1000 pay per post. You would need a pretty big following in order to get $1000, but an average small blog (30,000 pageviews per month) can earn between $50 – $150 per post! Ad revenue is way to earn income at no charge to the reader. It’s a passive way for bloggers to earn money because they don’t do anything to drive traffic to the ads. The ads are on their site and the blogger can focus on their content and other areas of business while still earning income. Product creation is becoming more and more popular among bloggers as a way to earn money through blogging. Products can be anything from a paid group forum, courses, printables, ebooks, and anything else you can imagine that someone might want to purchase. Product creation is possibly the most lucrative way to earn money from blogging because you have the most control over how much you earn through your product. Thinking about blogging, but don’t know where to start? Writing eBooks is a way to make money online. You can sell your ebooks yourself through a self-hosted website or you can upload your books to Amazon Kindle Direct Publishing. Selling products on Amazon is really powerful because their reach is so much greater than almost any other site. Amazon regularly has millions of visits per day to their site so there is greater potential to sell you book. Podcasting is a way to make money online with sponsorships and affiliate marketing, similar to blogging. It’s also a great way to grow your brand, connect with your audience, and provide high quality value. You can pretty much talk about anything on a podcast, but to grow your following you will need to be able to meet the needs of the people in your niche. Any time you can solve a problem there is a huge opportunity for earning income while you help people! YouTube is one of the top places people go online to search. You can make videos and earn money by building a following and sharing affiliate links, making sponsored videos, ad revenue, and receive free products. Seriously, anytime I want to learn how to do something…I usually go to YouTube to see if there is a video to show me how to do it. Everything from fixing something minor with my car to how to decorate cookies to fitness routines. People LOVE YouTube! You will need to do a lot research on keywords and how to be found on YouTube so that your videos will rank higher. Higher rankings means a bigger audience which means more money! Tutoring is a great way to use your skills and help students who are struggling and need support. Create a business locally by connecting with schools and after-school care programs. Depending on your subject you can charge $25 – $75 per hour to tutor students. Set up a Facebook page for your tutoring business and start spreading the news that you are accepting new students! A tutor in the areas of math and science are highly sought after. If you need a more flexible side hustle try tutoring online with a site like StudyPool. Do you have a special gift for music? Try offering music lessons to people in your local area. Offer lessons privately at the home of your students or have students come to your home for lessons. Another idea would be to connect with a local music shop and see if you could offer lessons there. It might be easier to find students through the music shop. Graphic design is a great way to make money online. You can provide graphic design services on a freelance basis to online businesses, bloggers, brick and mortar businesses, churches, non-profits etc. Everybody needs a web presence today, so there is a lot of work available that entrepreneurs just don’t have time to get too. Many small business owners don’t have the knowledge or skills to create graphics for their businesses. If you are a graphic designer by day, then use your network to find small projects that you can work on the side for extra income. Create digital products like printables, binders, paper party supplies, invitations, wall art, and more. Etsy is a great place to start selling your digital products or sell them on your blog. You can use free services like Canva.com (my favorite design tool) or Pic Monkey to get started. Here you will be able to design graphics in a variety of sizes, save them as a PDF, and download them. There are tons of tutorials available on YouTube to teach you how to get started with either platform. Then set up an Etsy site (which is free to set up) and start selling your digital products! I’ve spent the last 6 months working with VIP Kid and it is a great flexible work from home job. I typically work 6 am – 9 am EST and earn approximately $20 per hour. This is something you could potentially do before work or on the weekends as a side hustle in the comfort of your own home! Basically, you are teaching Chinese children ages 5 – 12 in a one on one 25 minute session over a system similar to Skype. The lessons are totally prepared for you, and you only need to flip through the slides to prepare. I love teaching with VIP Kid! The students are precious and it is such an incredible way to travel the world from the comfort of your own home. The hiring process is intense, you can read about my experience and get tips for how to pass the interview. You can design t-shirts and sell them on Amazon! Why is this AWESOME?! Because Amazon has millions of views everyday of people who are searching to BUY stuff. This is an amazing opportunity and it’s only at the beginning stages. Currently you can only upload t-shirt designs to be sold on Amazon. But there are rumors that Amazon will be expanding to hoodies, hats, sunglasses, and more. Imagine your designs available for the world to purchase! You make money with Merch by Amazon through royalties which means you earn a percentage of the sell. So if a t-shirt sells for $19 then you earn $7. Multiply that by 10 sales a day and you are earning $70 a day! You have to ask for an invitation to join Merch by Amazon. So go sign up at Merch by Amazon and then start doing your research of how to get your shirts found. Then get busy designing! Read more about the Merch by Amazon opportunity and start earning passive income with Amazon! Investing money is a great way to earn extra cash. I kind of became obsessed when I watched the movie The Big Short about how a few individuals basically invested their money against the American economy before the economic crisis of 2007. It’s crazy how much money can be earned and lost with investing, so you have to be careful where you invest. Stash – For beginner investors. You can start with as little as a $5 investment! Ally Invest – Hands on investing. Flexibility to choose your investments (stocks, bonds, ETFs, etc) and responsibility to balance your portfolio on your own. This is only recommended if you’re interested in spending time researching and learning more about stocks. Personal Capital – Track your investments from 401k and other investments you may have. You can get an overall picture of your financial life with Personal Capital. A new form of investing is through cryptocurrency like Bitcoin. You may have seen Bitcoin in the news recently with the rapid increase of the value of a Bitcoin. This should be considered a very risky investment opportunity, but you should definitely read up on it. This is a helpful article for Bitcoin beginners and you should definitely check out this documentary Banking on Bitcoin on Netflix. Writing can be a fun way to earn extra money. If you enjoy researching and writing there are some easy ways you can start earning extra cash as a side hustle! Every website on the interwebs needs fresh content for their site and you can earn anywhere from $15 – $500+ for writing amazing content! A few of my favorite places to find content freelance writing jobs are Indeed.com, Problogger Jobs Board, and even Craigslist! If you think this sounds like something you could do, but you have no idea where to start…then I highly suggest looking into Gina Horkey’s online Freelance Writing course. She’s been earning a living as a virtual assistant and freelance writer for a few years and now teaches others how to get started freelance writing on their own! I would be terrible at this because cleaning is not my jam…BUT if you really love cars and can be very meticulous you could make $120 – $200 per car! You would need to consider the cost of supplies and the amount of time it would take you to detail a car. I hate to think about what my cheerio infested car would cost to be detailed…but a girl can dream (of fresh clean car)! How can you turn traveling into a hobby? I don’t know about you, but I seriously am addicted to shows like The Good Wife. You can earn extra cash by taking part in mock trials, and pretend like you’re on your favorite law show. Check out Online Verdict to become an online mock jury member. Real life attorneys use the mock trial to predict how their cases will unfold in front of a real jury. Mystery shopping is a great way to earn free products and services while getting paid. I use Best Mark to make money with mystery shopping and typically I have dry cleaning, oil changes, and a sit down restaurant opportunities each month. These are an easy way to earn cash for things that I already need to do anyway…like eat! Are you a fan of Flip or Flop? We have a friend who works full time as a teacher and soccer coach at a local high school. During his school breaks, he works on refurbishing houses that he and a partner purchase for a very good price. They spent a couple of months and a lot of sweat getting the house up to date, but they were able to flip the house and make a profit. Just remember that you need to have enough money to purchase the house and do the repairs. It’s important to leave a little room in your budget for unexpected situations that will most likely occur! My brother started a Stand Up Paddleboard rental a few years ago as a side hustle while he was in college. He rented boards for $20 – $30 per hour per person. When he was ready to move off to his first real job he was able to sell his Stand Up Paddleboards for a profit. It was such a great side hustle for him because he loves the outdoors, being at the lake, and SUPs. People are currently obsessed with that Magnolia/Farm House Style. If you are skilled with the saw and love working with wood then you could make money building tables, benches, and even barn doors. A barn door can go for $1000 – $2500 depending on the amount of detail involved on the door. My college bestie now lives in a college town up north where her husband is a professor. They just started renting out their home on college game day weekends and were able to pay their mortgage each month with their rental during football season. They used a local college rental service, but you can do the same thing and rent a room or even your whole house on Air BnB. Want to get started on Air BnB? Learn more in this Air BnB Beginner’s Guide. and that’s where you come in. Help people create a budget, set a schedule, and stay on task in order to help them achieve their perfect event! Get started by networking with businesses that provide wedding/event services. Offer your services for free to a few clients in exchange for positive reviews that you can share on your social media and website. Colleen Munyan of Unique Settings turned her love of antique table settings into a beautiful business. She rents out her plates, glasses, and flatware for special events. And they are GORGEOUS! If you love all the pretty things, then I can’t imagine a more fun way to spend your time decorating for beautiful events! Here is Colleen’s story about how she got started with her business and how you can open a franchise of Unique Settings in your own town! Network Marketing is a great way to be apart of a supportive network that can help you learn about business. This is really helpful when you are coming from a background that is not in business/sales. You will be selling products to friends and family to begin with, but will work to grow and develop your network. Learn how to utilize online tools like Facebook Groups, Pinterest, email marketing, and blogging to market your products and your business. I’ve done some research to learn more about how to go beyond selling to family and friends and making real money with network marketing. Little Green Notebook is one of my favorite designers on Instagram. She lives out West and obviously has a high price for traveling to decorate homes *sigh*. But how great would it be to higher someone local with amazing style that is similar to Little Green Notebook or could at least give something close that design! Make money decorating homes and start by charging $100 per hour for ideas. You could include shopping services, pricing per room, and even work with local furniture stores to earn a percentage of any products that you sell. There are lots of opportunities to earn money with home decorating! Make sure to offer a variety of price levels so that you can have more opportunity to build your client base. Calligraphy is a beautiful art form that has come back into popularity in the past few years. It takes precision, patience, and practice to be successful with calligraphy. You can charge $0.50 – $2.25+ per envelope (small inner envelope/outer envelope). An average wedding will send 100 or more invitations making your price $250 plus any add on specials like special colors, etc. Do you love to repurpose old furniture? Unique furniture pieces that have been repurposed and repainted are popular in home design. Start earning extra cash by purchasing unique pieces from yard sales, estate sales, thrift stores, and flea markets. Then sand, paint, and create a new amazing piece to sell. I often see beautiful repurposed pieces on Facebook’s Marketplace. You can post your pieces on Facebook and Instagram or find a shop that you can partner with to sell your items. My husband has band me from painting anything else at our house and for good reason. I’ll be honest here…I’m terrible at painting. And I really try hard to do it well! There are plenty of people like me who need someone to help them paint their homes inside and out. Start small by painting for friends or family members, share your awesome work on social media, get a few business cards, and watch your business grow. Make sure to keep your prices competitive while making your hard work worth the effort! Make money while driving for services like Uber or Lyft. This is a really easy way to make money and super flexible. You basically work when it makes fits with your schedule. If you like driving around and talking to people, then this could be a great hobby for you to make extra cash! My husband has a friend from childhood who is very smart. He earned a bachelor’s degree from Duke University in Biology and was accepted into medical school, but he decided to pass on med school because of his hobby buying and selling event tickets on sites like Stub Hub. We’ve even benefitted from a few tickets that didn’t sell when we were able to attend the Ryder Cup. Basically you need to buy tickets when they are first available, so you will need to have credit cards (certain events offer priority tickets for specific credit cards), join fan clubs, and follow along on social media. Then you buy tickets to events/concerts that are predicted to be sold out. So you may not be a Taylor Swift fan, but you will be purchasing tickets to re-sale through another online venue. You can contact local fence companies or construction companies that receive shipments on pallets to see if you can have their old wood or pallets (hopefully for free!). Old fence boards and pallets have become very popular in the DIY/Craft world. People make everything from pallet signs to pallet furniture like this pallet wood coffee table. Once you get the wood you will need to remove all the nails and then post it for sale on social media and Craigslist. You can make extra cash by creating beautiful designs with your Silhouette or Cricut machine. You can monogram almost anything with vinyl lettering from clothing, glassware, artwork, and more. Prices range from $15 – $25+ depending on the project. These are great items to sell on Etsy, Facebook Marketplace, Instagram, craft fairs, and flea markets. My friend at Bright Spots Cards and Vinyl has the best products for sale! Personalization is what makes any gift special and unique. You can use an embroidery machine to monogram baby clothes, pillowcases, hats, jackets, backpacks, tea towels…just about anything you can think of! Sell your products on Etsy, create a Facebook page for your business, Instagram account, and even craft fairs. Saving money is kind of like making money…you end up with more money than you would normally have spent. There are many people who coupon their way to Disney World or coupon to become debt free! Collect coupons from newspapers, print online coupons, and use couponing apps to save money. My favorite couponing apps are Ibotta, Ebates, and Shopkick. Just scan your purchases and receipt to earn cash back with Ibotta! When you are shopping online use Ebates to earn cash back at hundreds of online stores including favorites like Target, Walmart, Amazon! Shopkick is the easiest way to earn cash back. All you have to do is turn your app on as you walk into a store and earn kicks which you can trade for a gift card! Find out how to earn more with apps just like these! You can make money while watching TV with the Swagbucks app. Swagbucks will reward you with points for watching video clips of everything from late night tv clips, movie previews, music videos, and more. You can get started earning with Swagbucks today! You can earn extra cash by playing in contests and sweepstakes! Most people don’t sign up for contests and sweepstakes because they think they won’t win. But you can never win if you never try! Use a form filler like Roboform. Sign up for a sweepstakes service like SweepsAdvantage that compiles a list of all the sweepstakes that you can apply to. Create an email address that is dedicated to contests and sweepstakes. If you are already working hard at losing weight, then you should sign up for Healthywage to earn money for your weight loss. Healthywage is a platform that you can bet against yourself to lose weight. You will join a group and at the end of the set time you will split the money between the winners. The weightloss goal is 4% of your current weight, so it’s a realistic amount of weight to lose over a short amount of time. I love Healthywage because it’s a way to earn cash and it motivates you to meet your goals! You can make money by sharing your user experience on websites. User Testing is a company that pays people to record their thoughts and actions as they scroll through websites and apps. Businesses use this information to create a better user experience for their customers. You can earn $3 – $10 for 5 – 20 minutes of work! All you do is scroll through different sites and make quick cash! Sign up with User Testing and start earning cash today! Not everyone has the ability to get organized. Many people feel totally overwhelmed and have no idea where to start. You can help people go through their clothes, old things they feel guilty for getting rid of, and help create an organized area. You could even help them create a capsule wardrobe to help them organize their clothing. This would be helpful when trying to create space in their closets. IDEA: Create an ebook or printable that you can sell on your website! Then you would be able to help people all over the world instead of just your local area. Yes! You can seriously turn playing video games into a hobby. Check out twitch.tv and youtube.com where you will find tons of people playing games. You can earn money as a gamer by gaining sponsors, making money through ads, and affiliate links. You will need to build a following, but this is a totally real way to turn your hobby in to cash! Some people have even been signed to gaming teams that compete internationally! Do you know details about Taylor Swift’s latest concert tour? Or insight into Justin Bieber and Selena Gomez’s new relationship? Then you should be writing celebrity news and earning some extra cash from all your celebrity knowledge. You can apply for a freelance writing job in celebrity news with Bustle. If you have years of knowledge and experience in a specific field then you can create a course to sell online. You can sell your course through your own blog or sell on sites like Udemy, Skillshare, or Lynda.com. This is a great way to make passive income! Once you create your course and place it on the platform you earn money when ever someone signs up to take the course. It’s important that you take time to create a high quality course, so the beginning of this project will be time consuming. But it will pay off in the end! Who knew you could make money making crafts? There are thousands of people making an extra $500 or more per month selling crafts on Etsy, at local craft fairs, and on social media! If you’re wondering what kind of crafts you should be selling then make sure you check out the best crafts to make money with Cricut. Heat press vinyl is very popular and you can find it on everything from t-shirts, cups, and wall art. Do you like the idea of reaching a broad audience by selling on Etsy? Then make sure you check out these trending Etsy crafts! By now, I hope that you can see that you can turn any hobby into a money making opportunity. Any time you can teach others about something you can do very well, you will be able to earn money! So maybe you’re into collecting rocks, collecting baseball cards, sewing, horse back riding, hiking, etc. Take your knowledge and help others get started in your hobby. One of the best ways to do this is by starting a blog. (See number 7) An online presence is important because you have the potential to reach a much higher number of people in your niche. How do you plan on making money with your hobbies? Want to do more than make money with a hobby? Check out Caitlin Pyle’s FREE Work at Home Mini Course with over 73 skills and services you can offer as a work from home job. It also includes 77 businesses that will ACTUALLY hire for these services!